UPDATED and SPONSORED POST! 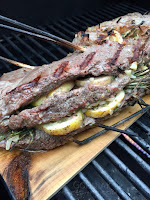 This post originally appeared in May 2009 but I decided to revisit it to make it relevant for a barbecue post as well as for my Collingswood Farmers' Market posts. Scott, from Nature's Own Farm, was kind enough to donate to me an impressively large and succulent pork shoulder. 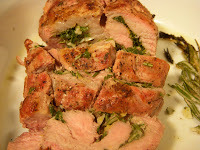 The original recipe was made with a pork loin but after having made it with the shoulder, I can attest that the recipe works with either cut. I've included both versions since the techniques are the same, only the cooking time varies since you need to have the internal temperature reach 145 degrees Fahrenheit. 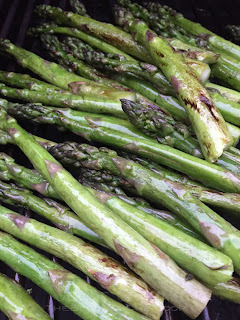 with grilled asparagus, steamed potatoes and a green salad. 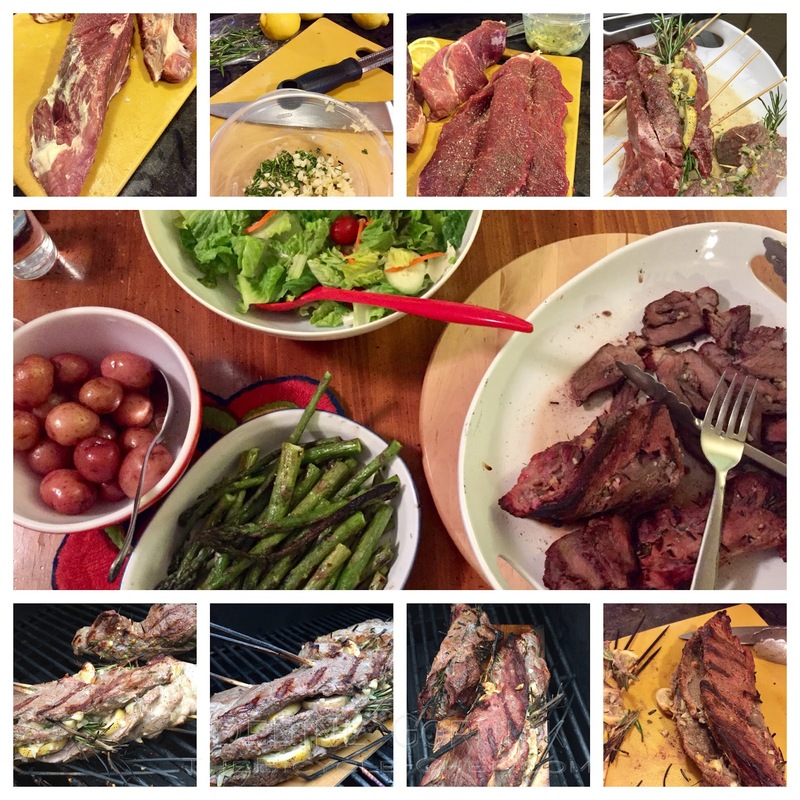 Having a gas grill means never having to say you are sorry you can't grill tonight. 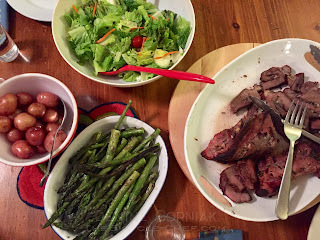 I know there are the hardwood charcoal purists out there who feel grilling isn't grilling without a hot coal fire under your primal cuts of meat. The smokey aroma, the char, the higher heat all adding to the deep outdoorsy taste. Believe me, I love real grilling over good charcoal, but I hate the time it takes for the coals to get to the perfect amber glow. Even when I have used a chimney starter, it just takes too darn long and I feel like there is so much waste of good fire. When I want to grill, I don't want to have to plan and wait almost an hour before I can get my food on the grates. If it rains and I have planned to cook outdoors with propane I can. A trick I discovered to get a deep smokey taste is to use a cedar plank or a smoker box with some apple wood or hickory chips, or even to use whole woody herbs like rosemary to create the smoke and fire without the hassle of waiting for the coals to do their thing. This meal comes together in a snap. 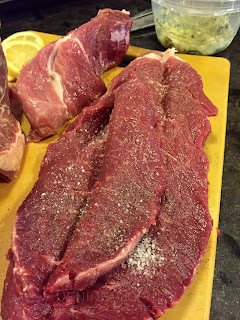 In my original testing of this recipe, I used a third of a boneless pork loin (it was so big I cut it into three pieces and froze the other pieces another use later). For this version, the pork shoulder was around 5 pounds with the bone. I deboned it, and cut it into smaller portions. One portion was 3 pounds, the other around 1 pound. The bone was scrapped. The pork loin or shoulder is butterflied open so it can be stuffed with garlic, rosemary, parsley, lemon zest and salt and pepper. 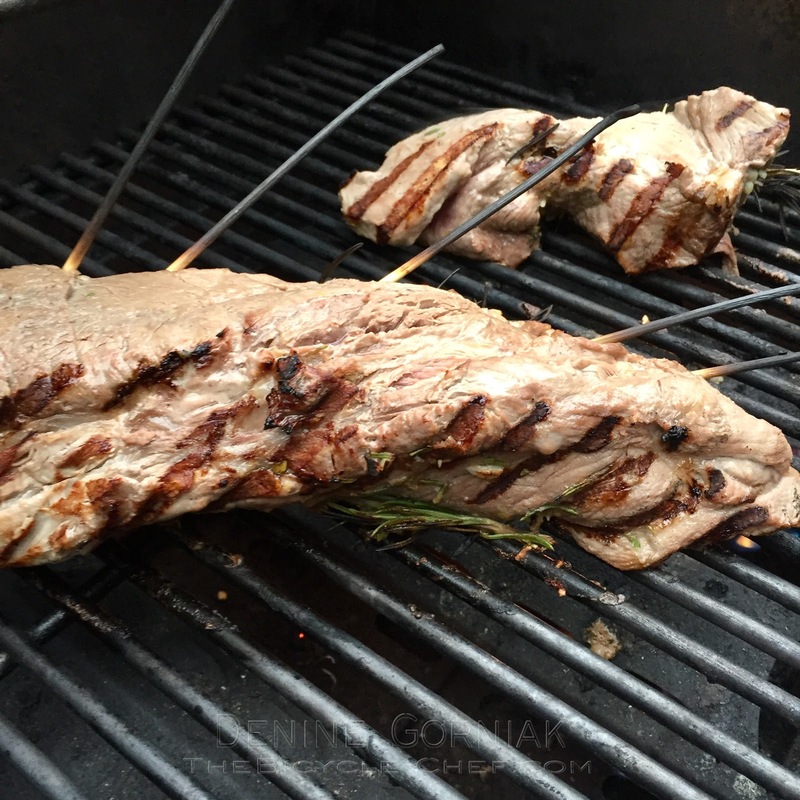 The pork loin or shoulder is then closed by 'trussing" it shut with skewers or a couple of toothpicks. 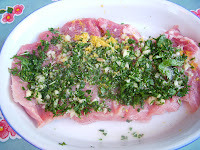 Then, the pork is seasoned the outside with salt, pepper and olive oil and grilled it on the outside to achieve grill marks/colour. The pork is finished cooking on a cedar plank. In about 30-45 minutes, the pork is done. 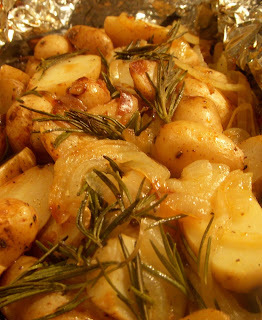 For a side starch dish, you can make "Cowboy-style" fingerling potatoes with garlic, onions and rosemary, salt, pepper and olive oil, cooked in a foil packet on the grill. The potato packet can go on the grill while it preheats and will be done at the same time as the pork. This is a dinner that waits for no one! Alternatively, you can boil some small new potatoes in salted water; put the potatoes into a sauce pan, cover with cold water, season generously with kosher salt, and bring the potatoes to a boil. Reducing the heat down to a simmer and cook until the potatoes are knife tender. Season the potatoes with olive oil, salt and pepper. 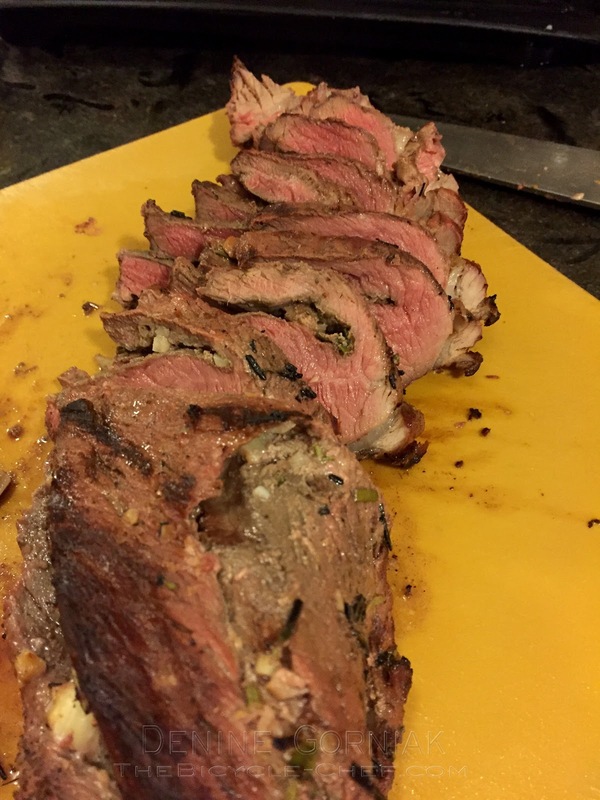 The side green was grilled asparagus. It's in full season in NJ so I'm taking advantage as much as I can by eating it as often as I can while the farmers are bringing it to market. Bamboo Skewers or Toothpicks - soaked for 15 minutes in water. 1. Preheat your grill; while your grill or coals are preheating, butterfly open the pork loin and sprinkle with salt and freshly ground pepper. 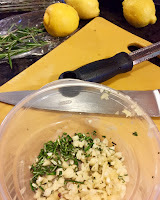 Spread a layer of finely chopped fresh parsley, rosemary, minced garlic and the zest of a lemon. Squeeze half of the lemon's juice over the stuffing and drizzle with olive oil. 2. Close or fold the pork back together and truss/seal with several toothpicks or bamboo skewers. 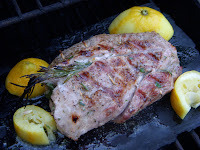 Season the outside of the pork loin with additional salt, pepper, olive oil and the rest of the lemon juice. 3. Reduce the grill heat to medium. 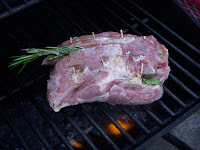 Place the pork on the grill and sear on the top and bottom, cooking it on each side long enough to create grill marks and to be able to move the pork easily without tearing it or having it stick to the grill - about 8 minutes on the first side, 5 on the next. 4. Once the pork has been seared, place it on a prepared and soaked cedar grilling plank. 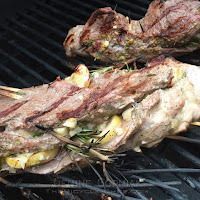 Place the cedar plank on the grill, raising the heat to medium-high. Close the lid and allow the grill plank to char and smoke. Occasionally check on the plank to make sure it is not burning. Douse with water from a squirt bottle if necessary. 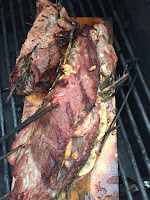 Cook until the internal temperature of the pork reaches 145 degrees, or the when the inner layers are no longer pink, the juices run clear - about 20 to 25 minutes for a pork loin, or 30-45 minutes for a pork shoulder. 5. 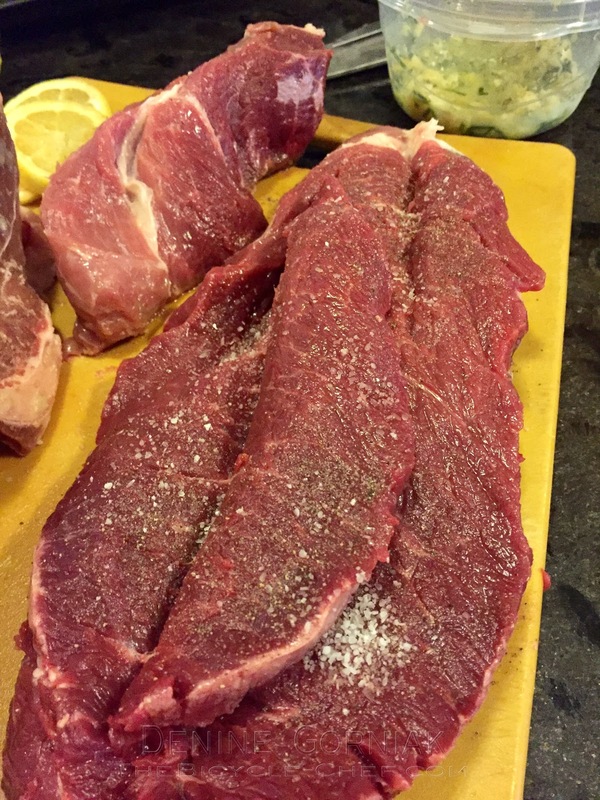 Allow the meat to rest, covered loosely with aluminum foil, for 10 to 15 minutes before slicing. Remove the toothpicks then slice into quarter-inch thick slices. The pork loin, which was about a pound served two. The pork shoulder was larger, and I had cut it into one large and one small piece. It served three of us for dinner and we ate a lot, with plenty of left-overs. I think I had about 3 pounds o f shoulder. It would be enough for a decent barbecue for several guests. The pork loin, when served with ample sides, and not a ravenous appetites yielded 3 servings - about 9 slices altogether, 3 per serving. The pork shoulder gave us enough food for 6 people, probably up to 8 people. I prefer meat to be on the medium rare side. This is ideal for reheating and finishing the carry-over cooking, so I pulled the shoulder off the grill when it reached around 125-130 degrees. Reheating it will finish the cooking. Delicious! I made this today and it was a huge hit. 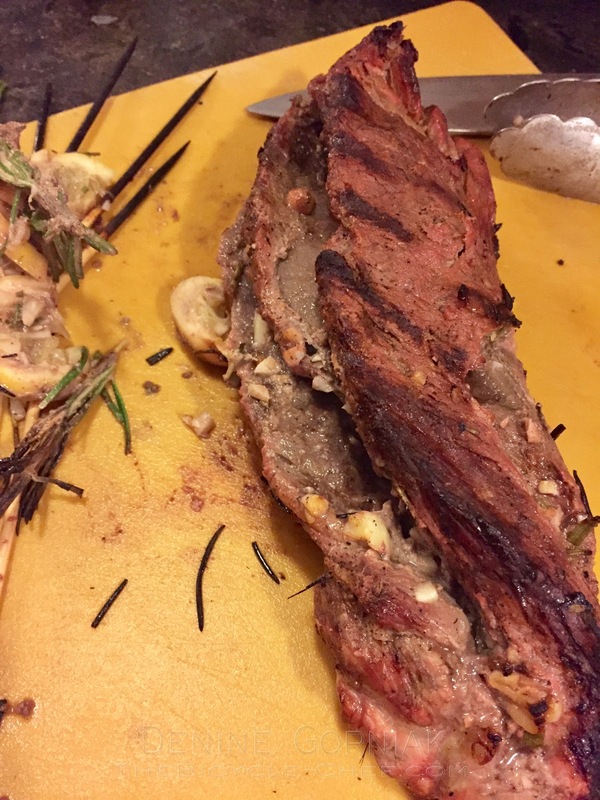 My first plank grilling experience was a huge success. Thanks! oh! so happy to hear. 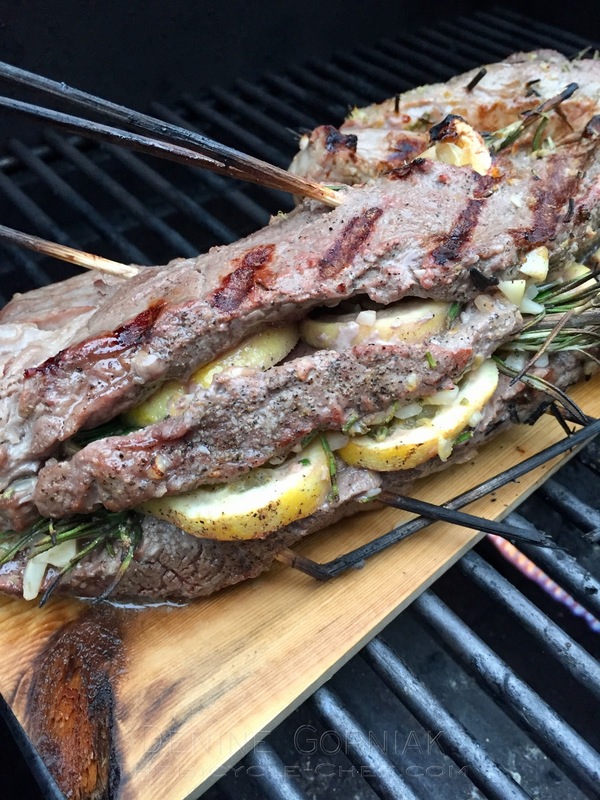 what's wonderful about plank grilling is you can use them for more than just fish. I use them for the pork, i've used them for tofu - which makes the tofu have so much flavor and really helps it on the grill. as the cedar planks burn down, you can add the charred pieces to a small smoker box (which you can buy at a hardware store) and then continue to get all the use of the plank until it's just ashes! The ashes can then go into the compost heap or right into the soil! Get Toasted for Mother's Day!